If you have sensitive eyes, as I do, or if you wear contact lenses, then you know the importance of an ultra-gentle eye makeup remover. I have tried so many eye makeup removers that purported to be gentle only to be dismayed when they made my eyes burn, sting and water– all of which often resulted in irritated, red eyes. That is not my idea of a gentle eye makeup remover, period! Lancôme Bi-Facil Double Action Eye Makeup Remover is an ultra-gentle dual-phase eye makeup remover that removes every trace of makeup– including the most resilient waterproof formulas– and it does so without the need to tug or pull the delicate eye area. Furthermore, it never stings or irritates my sensitive eyes, and boasts the added benefit of leaving my skin conditioned. I must also add that I am glad that this formula does not contain artificial coloring– there is no need for it, and frankly I prefer not to have it in a product that is supposed to remove makeup! There is a reason that Lancôme Bi-Facil Double-Action Eye Makeup Remover has a cult following, and that it was the winner of Allure magazine's 'Best of Beauty' Award. 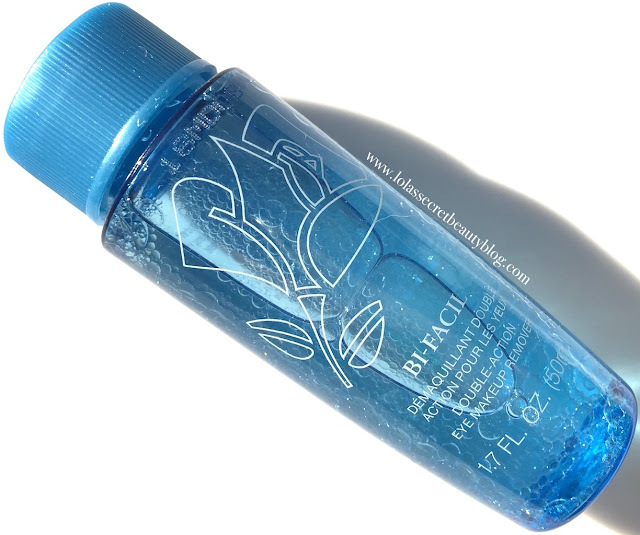 Lancôme Bi-Facil Double-Action Eye Makeup Remover is a double-phase, fresh-as-water liquid eye makeup remover. Ideal for sensitive skin and contact wearers, the eye makeup remover leaves your eyes feeling cool and relaxed with no oily residue. It works by activating when it’s shaken to gently whisk away even waterproof eye makeup while conditioning and refreshing the skin. Directions: Shake to activate. Apply liberally to a cotton pad. Gently press over closed eyes then sweep away makeup with downward strokes. Ingredients: Aqua / Water / Eau, Cyclopentasiloxane, Isohexadecane, Sodium Chloride, Poloxamer 184, Hexylene Glycol, Dipotassium Phosphate, Benzyl Alcohol, Potassium Phosphate, Quaternium-15, Benzalkonium Chloride, Parfum / Fragrance, Citronellol, Geraniol. Overall Assessment: This is a great eye makeup remover, and I definitely plan to purchase the biggest size bottle as soon as I finish this one up! $15.00-$39.00 for 1.7 oz. to 6.8oz. from Lancôme, Nordstrom, Macy's, Ulta, Neiman Marcus, Bloomingdale's, Dillard's, Sephora and Bergdorf Goodman (Affiliate Links). It's so interesting how everyone is different. This is one eye make up remover that stings my eyes. I have many mini gwp bottles of it around here and never use it because of it. I do have great luck with Bioderma Sensibio H2O, though. So true! I find this so incredibly gentle on my super sensitive eyes! I really need to try that Bioderma! It's good to know ones work for you. I find it rather impossible o predict which makeup removers will bother my eyes as well. Some that purport to be extremely gentle cause my eyes to sting and burn like mad! This one really works wonders for me, and there is no hint of irritation, but it does sting Marcia and cpl100's eyes– so as you said, it can be hard to predict! It's definitely my current favorite as well! I am so glad that you love it too! This is my makeup artist sister's favorite eye makeup remover. I find it stings my eyes so she's always the recipient if I get the small ones. I definitely understand why your sister loves it as much as she does!. It's too bad that it stings your eyes! I wonder which of the ingredients are irritating. Sounds intriguing b/c everything almost burns my eyes. I might have to try this out. This one definitely doesn't sting my eyes, but Marcia and cpl100 find that it stings theirs– so it is definitely worth seeing if you can try a sample before investing in a big bottle. I used to love this eye makeup remover and just stopped using it because I haven't made it to the lancome counter, but it was my favorite... and I loved that it would remove my waterproof mascara. I feel the same way about this makeup remover, and it is so effective and efficient in the removal of super resilient waterproof mascara! I do like dual action makeup removers like this. My eyes are so sensitive. Dual action makeup removes are my preference because they are so efficient in their ability to break down makeup– including waterproof formulas. My eyes are super sensitive as well, and this hasn't caused my eyes any irritation. That said, it did sting Marcia's eyes– so as with everything else– it won't work for everyone. Before Micellars were available everywhere this was my go to. Such a great remover! It is such a great remover, and I am not in the least bit surprised that it was your fave!